We know that caregiving is a full-time job, particularly for those caring for someone at home. Because of this, it is not uncommon for caregivers’ health to suffer in some way. For example, doctors’ appointments may be missed if a loved one is having a bad day; meals may become unbalanced due to caring for a loved one who is only interested in eating sweeter things or who becomes “stuck” on one particular food item; meals might be omitted because we are trying so hard to get nutrition into our loved one that we forget to feed ourselves; etc. Look for opportunities to exercise with your loved one. 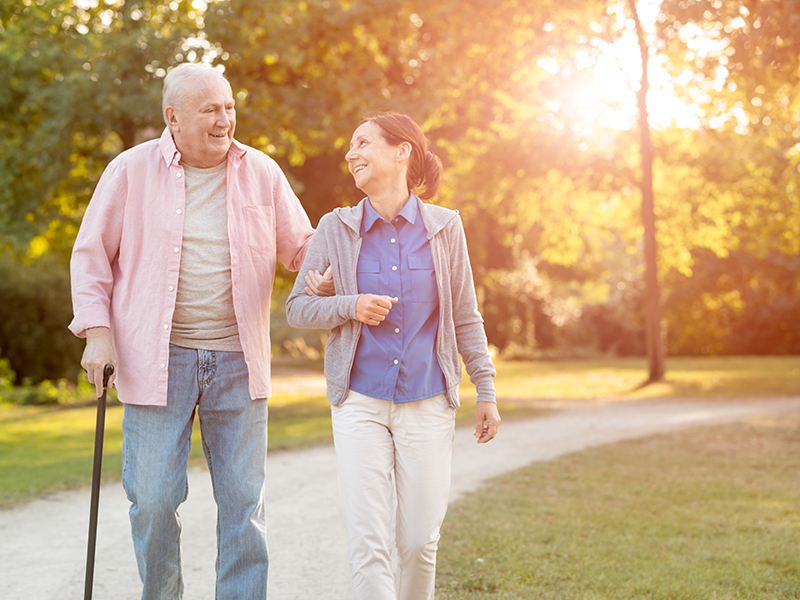 A 20 – 30-minute walk during the day can help you both feel better. Just because the weather has turned chillier, it doesn’t mean you both can’t bundle up and enjoy a walk on a brisk winter day! If it appears to be slippery, consider adding ice grippers to the bottoms of shoes/boots for more secure footing. Multi-task. Look for ways to exercise while doing other things. For instance, if you are standing at the sink washing dishes, you can also use that time to do full or partial leg squats to keep your bottom and leg muscles firm. You could also do leg lifts or torso twists while brushing your teeth to work additional muscles. Exercise while your loved one is sleeping. There are many great exercise DVDs on the market. Find one that suits your fitness level and work with it while your loved one naps or goes to sleep for the night. Break exercise into smaller increments. Recent studies show that exercising periodically throughout the day may actually be more effective than exercising for 45 – 60 minutes at a time. Try 10 – 15 minutes of exercise two or three times a day and you may see your metabolism begin to creep up! However you find the time, it is important that you keep exercise in your daily routine. In addition to the positive physical aspects that you will experience, the endorphins that are released during exercise will keep you in a better place emotionally to care for your loved one.